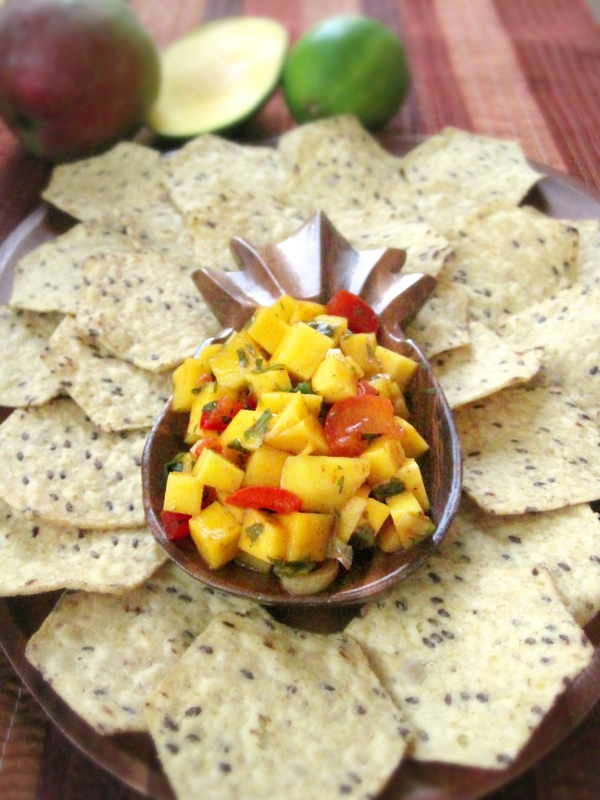 This mango salsa is a yummy accompaniment to tortilla chips and could also be a condiment to fish, chicken or pork. Try it with the White Fish Patties! Place diced red pepper in a microwavable bowl and microwave for 2 minutes or until softened. Stir in diced mangoes, scallions, and cilantro. Season with lime juice, salt, pepper, and chili powder to taste. Add honey if needed to sweeten tart mangoes. Note: There are a few varieties of mango that are commonly found in American groceries stores. The most common are the Haden, Tommy Atkins, and Kent varieties, all of which have yellow or green skins with a reddish blush to them. If you do find an Ataulfo or Champagne mango, it will have a smaller, kidney-like shape, yellow skin, and small pit, so use 5 or 6 for this recipe. To choose a ripe but firm (common) mango make sure it has a reddish blush and firm skin. The mango should give slightly when squeezed and be fragrant. If you accidentally peel a mango that is too green, no worries, cut it into small slices, season with lime juice and sprinkle with salt. You’ve just made mangoviche! Delicious!